Japanese beetles were first found in the United States in 1916 near Riverton, New Jersey. Inspections of products brought into the U.S. didn't begin until 1912, so the beetles had plenty of time to multiply and spread. They are a huge problem for the eastern and mid-western states. The adults are oval, shiny metallic green with copper brown outer wings, about 1/2 inch long and 1/4 inch wide. They are most active when temperatures reach 85 degrees Fahrenheit and there is not much breeze. The beetles release chemicals called pheromones into the air, which attract other beetles. Although traps (for adult beetles) and Milky Spore (for grubs) might be a little expensive, consider the destruction to your flower and vegetable garden. Japanese beetle adults eat flowers and foliage, leaving only leaf veins. They feed almost all summer, so if you don't get control of them early, your flower blooms and leaves will be eaten, and you may not have much of a garden crop. Damaged leaves attract other beetles, so pull them off as you see them. Throw them in the trash; not on the ground or in a compost pile. Recognizing adult Japanese beetles is easy since they have a shiny greenish brown metallic color which reflects in the sunlight. 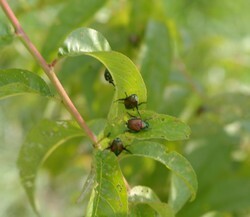 These beetles were on one of my sister's dwarf peach trees. They seemed to favor her peach trees, roses, and raspberry bushes, although there were some on other plants, too. Beginning in late July, the female Japanese beetle starts laying eggs at a plant's base. She continues until fifty or more eggs have been laid.... and this is just one beetle! In a few weeks, the eggs hatch into white grubs of the larval stage. Once hatched, the grubs will burrow through the soil and feed on roots during the fall and early winter until they hibernate. If you have grubs in your lawn, you'll see areas of dead grass during dry spells in autumn. In the spring, when hibernation ends, the grubs begin eating again. In late spring they enter the pupa stage. The pupa stage lasts about two weeks and then the adult Japanese beetle emerges. So you'll be infested with these beetles plus others that are attracted to them. So be on the alert for Japanese beetles as soon as temperatures rise in early summer. Patrol your lawn, garden, and trees as often as you can. See if your neighbors will also join you in your fight against the beetles. 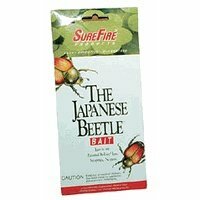 Have You Ever Had Japanese Beetles Attack Your Plants? What Plants do Japanese Beetles Favor? Adult Japanese beetles eat over 300 varieties of plants, so there aren't many that they don't attack. Some plants they favor are: roses, hydrangea, basil, iris, wisteria, raspberry, blackberry, beans, okra, sweet corn (foliage and silks) and asparagus. They tend to avoid these trees and plants: Arborvitae, boxwood, dogwood, firs, hemlock, holly, junipers, lilac, magnolia, oaks, pines, redbud, red Maple, rhododendrons, spruces, white ash, white poplar, yews, catnip, chives, garlic, tansy and rue. A trap crop attracts parasitic insects away from your nearby crops. This form of companion planting can save the main agricultural crop from decimation by pests without using pesticides. Trap crops can be planted around the circumference of the field to be protected, or interspersed among them - maybe planting them every eighth row. Good plants for trap crops include African marigold, evening primrose, borage, four o'clocks, soybeans, wild grapes, white and pastel zinnias, blackberries, and knot-weed. The safest and most inexpensive way to kill the beetles is to pick or shake them off the plants and drop them into a bucket of soapy water. If you can't stand to pick up a beetle, you can use a soda bottle and hold it under the insect and it'll slide in through the small hole. It takes a little longer this way, though. This is a photo of Japanese beetles I collected from my sister's peach trees and flowers. They're easy to pick when it's early in the morning and the temperature is fairly cool. Once it gets hot, they start flying around and you can't catch them. If you need to get beetles from tall plants or trees, spread a light colored sheet out under them early in the morning. Shake the plants or tree branches and the beetles will fall onto the sheet. Dew and cooler air keeps them from flying. Dump them into a bucket of soapy water making sure you don't include any beneficial insects such as ladybugs. Keep the beetles in the soapy water for at least 24 hours. If you dump them out only a few hours later, they can revive and fly away. Capturing Japanese beetles is an ongoing job; don't just stop after one day. Even if you think you found all the beetles, there will be more flying in to take over. You could even enlist your kids or neighborhood kids to capture beetles. Most kids like to kill bugs; just make sure they know how to identify the beetles and they don't kill any beneficial bugs. There's a whole lot of controversy over whether Japanese Beetle traps work or if they attract more beetles to your property. Decide if you can pick them off yourself and control them that way. If cost is an issue, determine the cost of the flowers and crops you'll lose if the beetles take over. If you buy them, place them AWAY from the plants you want to protect. 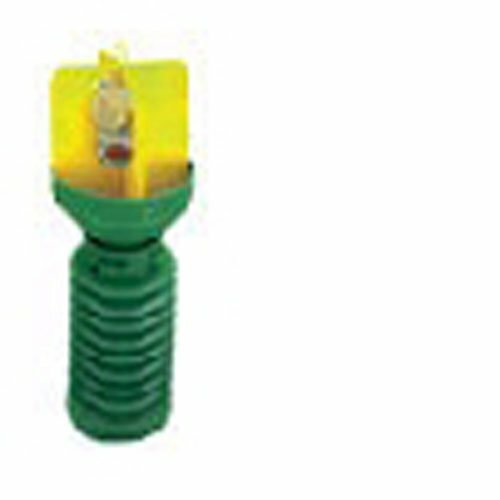 Empty the traps daily because the smell of decomposing beetles will override the bait scent. Ask your neighbors if they'll also put up traps so beetles won't fly from yard to yard. The traps shown here have plastic containers to collect the beetles. There are also traps with plastic bags. If you buy traps with bags, see how often they can be reused and how easily they are to empty. Once Japanese beetles mate and the eggs hatch, grubs will eat your grass and plant roots in the fall until they hibernate for the winter. In the spring, they'll begin eating again until they become adults, and then the cycle begins again. So it's wise to kill both the adults beetles AND the grubs. Bacillus popilliae spores (the active ingredient) in Milky Spore infect and kill Japanese beetle larvae (grubs). Milky Spore is NOT a poison, so it won't harm plants, pets, beneficial insects, earthworms, fish, bees, birds, wild animals, or humans. Milky Spore is approved and registered with the U.S. EPA (Environmental Protection Agency). Milky Spore Powder begins working as soon as it is applied, as long as grubs are feeding. Once Japanese beetle grubs are infected, they will multiply the spores and spread them further. In warm climates, you can gain control over the grubs in under three years. Once in the soil, Milky Spore powder continues to infect grubs for 10 years or longer. That's a good investment! You can apply Milky Spore powder anytime the ground is not frozen, but fall is the best time because grubs are more actively feeding to prepare for hibernation. The more grubs that ingest the powder, the faster it'll be spread underground. To use Milky Spore, place a level teaspoon of the powder on top of the grass in your lawn every four feet and in rows four feet apart; like a grid pattern (apply it the same way in your garden). A 10 oz. container will treat 2,500 square feet, and a 40 oz. box will treat 10,000 square feet; about a quarter acre. When you're finished, lightly water the area to soak the spores into the soil. As the grubs travel underground after they're infected, spores will spread so that the entire underground area becomes inoculated. This may take one to three years, but it's environmentally safe, you only have to apply the powder once, and once established, Milky Spore continues to work between 10 and 15 years. AN EXTRA BONUS: You won't be bothered as much bymoles, voles, gophers, and skunks because they won't have many grubs to eat. ~~ Do NOT mix the spore powder in water and spray it. The dust needs to be concentrated and applied in spots. ~~ Because the spore powder needs to be applied in spots, do not use fertilizer or grass seed spreaders. ~~ Don't mow your grass until the spore powder has been watered into the ground for at least 15 minutes. ~~Don't apply the powder on a windy day. Although it won't harm you if it gets on your skin or you breathe it, the wind may blow it away before you can water it. The powder needs to be applied in a concentrated area. ~~ Don't apply the powder if a heavy rain is expected. Although the powder needs to be watered to sink into the soil, you don't want it to be washed away. ~~ Keep in mind that using Milky Spore will reduce and eventually eliminate the Japanese beetle grub population, but it won't prevent the adult beetles from flying into your yard from untreated areas. But at least you won't be hatching your own beetles underground, so you'll have less to contend with each year. What Garden Insects Do You Have to Battle? happynutritionist - when I visited my grandparents as a child, he had us pick off the potato bugs and stomp them. I thought it was great fun. My parents and grandparents would put about an inch of turpentine in the bottom of about a 10 oz. jar, and would tap them from the roses into the jar with the lid. That was my job sometimes too as a child. I hope they didn't last long. Digby_Adams - I didn't know about Japanese beetles until I visited my sister in Tennessee a few years ago and helped pick them off. But when I was a child and visited my grandparents in Illinois, I picked off the potato beetles from their garden plants and stomped on them. My family has been growing organic raspberries for generations. The raspberry patch is always ringed by marigolds and zinnias. Since I was a child, my job has been to hunt for Japanese beetles and drown them in soapy water.